The question of whether technology will improve or further disrupt urban traffic remains, and will so until driverless cars are in mainstream operation, but autonomous vehicle testing and intelligence is rapidly advancing. Ahead of our Machine Intelligence in Autonomous Vehicle Summit in Amsterdam 28 & 29 June, we’re taking a look at the most recent breakthroughs and news in this space. Currently, all self-drive cars in testing are required to have a human backup driver in case of emergencies, but Delphi and Transdev have revealed that they are planning to use autonomous taxis and shuttles to carry passengers on roads in France. Two on-demand Renault Zoe autonomous taxis will be deployed in Rouen, Normandy, and a shuttle van will run between a rail station and campus in the university district of Paris-Saclay. Both will start out with human backup drivers but by 2018 they plan to be fully autonomous with no steering wheel or pedals. They’re planning to spread this technology through Paris and other cities and run these vehicles alongside cars, bikes, and pedestrians. Will people trust these vehicles, or are we going to see apprehension in passengers traveling in driverless cars? Intel and the research firm Strategy Analytics have just completed a study that makes this claim, and this activity will include nearly $4 trillion from driverless taxis and nearly $3 trillion from deliveries and business logistics. This estimation also includes $203 billion to be spend in new use cases in industries such as tourism and healthcare. Whilst people are apprehensive about driverless vehicles being on the roads, the real concern and short term worry is not the autonomous vehicle's safety, but the interaction with other manned vehicles. In this study, it is predicted that more than half a million lives would be saved between 2035 and 2045 because of the improved safety. 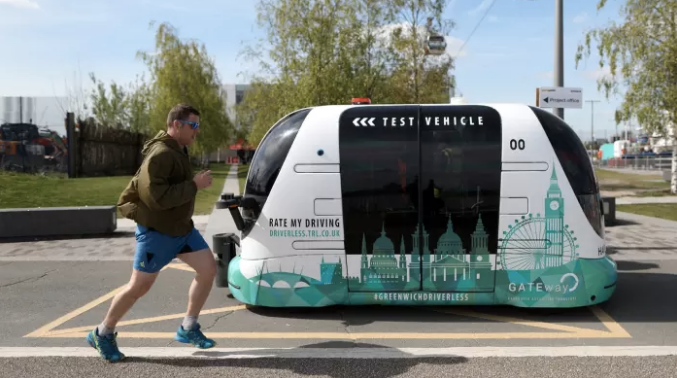 Although it's top speed is currently 10mph, residents of Greenwich peninsula in east London are becoming accustomed to the four-wheeled self-drive pod cruising along the Thames. The pod largely drives itself, but requires a human operator to monitor it just in case of any hiccups and it's one of many worldwide experiments exploring how these autonomous vehicles could work alongside mainstream traffic. The concern however, is that if technology provides a comfortable and stress free environment to travel in, people will be more keen to take privatised transport solutions rather than the more space-efficient public transport. It may also encourage people to commute further afield causing yet more traffic on the already overcrowded roads. The Greenwich pods are exploring how self-drive vehicles will interact with pedestrians, cyclists and other urban obstacles rather than just other vehicles that highway roads are preparing for. Cause for concern also stems from the idea of driverless cars sharing lanes with human operated vehicles, but Anthony Barrs and Baiyu Chen have proposed a ‘hyperlane’ system where self-driving cars can bypass mainstream traffic. This lane will be computer optimised and operated, and will eliminate the inevitability of autonomous vehicles getting clogged up in a robot traffic jam. This model however, won’t work in densely populated areas due to the inability to create additional road lanes, but in more spacious cities this could be a solution to overcrowded highways and inevitable traffic jams. Want to hear more about the current breakthroughs in autonomous vehicles? Join us in Amsterdam on 28 & 29 June for RE•WORK’s Machine Intelligence in Autonomous Vehicles Summit. Hear from companies such as TomTom, Toyota Motor Europe, Mapillary, EasyMile, Voyage and many more.